ERP selection is the last stage of your journey to a new ERP system. This is when you’ll narrow down your choices, investigate your short-list of vendors thoroughly, and make your final decision about your new ERP platform. Here are some resources to guide you to the finish line. On our ERP Research page, we discussed what modern ERP systems have to offer and the advantages and disadvantages of cloud ERP. We also talked about figuring out when it is time to upgrade your old legacy ERP. On our ERP Evaluation page, we discussed costs, deployment options, and available features of modern ERP systems. Now, we discuss how to begin the process of ERP selection in line with your company’s needs, timeline, and budget. 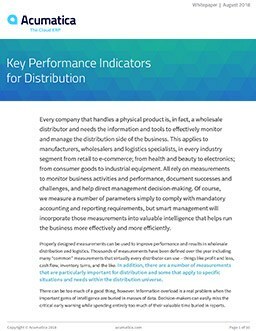 We hope you’ll use this information to evaluate potential ERP vendors objectively, so you’ll have total confidence that you’re selecting the best solution with the least amount of risk. Although we hope you’ll ultimately select Acumatica, we understand that we might not be the right choice for everyone. But we do hope you’ll give us a chance to show you our product! How do the different software vendors compare against each other? After the evaluation process, you should be able to find a few products that could fit your needs. Use the “Business Management System Evaluation Checklist” to help you in the ranking process. Does the solution address the specific pain points of my industry? Each industry has a unique set of challenges. That’s why your ERP selection process should focus on robust ERP systems that have specific functionality for your industry. Visit the Industry Solutions page and drill down into the industry scenarios to see the wide variety of industry functionality in Acumatica. Does the solution address my specific pain points by role? Each role in your organization has its own challenges that your new ERP system must address. Visit the “ERP Solutions by Role” page to review the requirements of each role within your organization. Does it have the reporting and analytics functionality needed in the future? BI is more than reports and dashboards. Modern BI is about visually giving your user up-to-date information and allowing them to dig into the data to solve problems. Can the ERP solution be extended with complementary solutions? As you make your ERP selection, keep in mind that no system comes with ALL the functionality you will ever need. That’s why it’s important to choose a system that lets you add specific functionality with ISV extensions. Acumatica has an online catalogue where you can see for yourself what is available and certified. Learn about our many product extensions from our Technology Partners. Find out why so many midsized companies are adopting cloud ERP and the specific benefits they’re gaining by moving to the cloud. In the past, ERP was always hosted in-house, managed by IT staff in an environment the organization controlled. The cloud represented an unknown where valuable company data and intellectual property could be compromised. Yet, as we pointed out on Researching ERP, most reported data breaches have happened in companies that keep their data on servers hosted in their facility. Today, more and more companies are rethinking this approach, deciding that the benefits and security of SaaS outweigh the perceived challenges. Mint Jutras reported that 50% of those surveyed cited lower total cost of ownership (TCO) and 47% also noted lower startup costs. They spoke candidly about the factors that should be considered, including cost, security, functional fit, integrated applications, data center architecture, regulatory requirements, and reliable internet connectivity. Your ERP price may vary depending on your scope of implementation, number of employees, customizations, and deployment method (on-premise or in the cloud). Let’s take a closer look at the factors that can affect ERP pricing—and the unique pricing model that can dramatically reduce your costs. ERP pricing has changed forever, thanks to the cloud. Cloud ERP can certainly save you money, but read your potential vendor’s pricing policies carefully before you make a final ERP selection. For maximum savings, choose a vendor that charges by resource consumption, not per user. What is Acumatica's licensing and pricing model? Since every ERP vendor is different, we will let our competitors explain their licensing and pricing models to you themselves. At Acumatica, pricing is very flexible. You choose what applications you want, the deployment model (in house, hosted, or SaaS), the licensing model (subscription or perpetual), and the resource level (small, medium, or large). And we NEVER charge you a per-user fee. Keep that in mind as you make your ERP selection. Visit our “Acumatica ERP Pricing” webpage to get a description of the details. What does an ERP implementation REALLY cost? The price quote you receive from your ERP vendor may not reflect all the real costs of implementing the new system. Plan for the costs you might not have anticipated. Know and anticipate ALL the costs of implementing a new ERP system. What is our possible ROI? Return on investment (ROI) is important, not only because it is almost always a requirement to get the project funded, but it also allows you to monitor progress and provides a reliable measure of a successful implementation. Selecting the right ERP is only the first step in moving to your new solution. You must also decide who is going to help you put the system into action – your implementation partner. Your successful implementation will depend as much on finding the right partner as finding the right software. Read this guide “Choosing an ERP implementation partner”. What can I expect when we "go live" on the new system? There are three ways to make the transition from testing and preparation to “live” operation: all-at-once (big bang), parallel operation, or in phases over an extended period of time. Each strategy has its benefits and its drawbacks – and none is completely right or wrong – but you should understand how your decision will impact time and costs. Who from our organization should be involved in the ERP implementation? ERP projects succeed or fail because of the implementation team. The team must have the right people which includes: an executive sponsor, a strong team leader, clear objectives, and sufficient budget and resources to successfully complete the job. Why make Acumatica your ERP selection? Visit the “Why Acumatica” web page to learn more. What are the industry analysts saying? Read more in the article “Awaken the Force of ERP.” You can also find PC Magazine’s review of Acumatica and get access to other analyst reports here. Read "Awaken the Force of ERP"
What do customers say about Acumatica? Before you make your final ERP selection, check our references. Acumatica has published dozens of success stories on our website.